The Supreme Court of Florida has ruled that in addition to established police self-defense laws, Law Enforcement Officers can now as well rely on the immunity from prosecution protections of the ‘Stand Your Ground’ doctrine that had previously only been available to civilians. 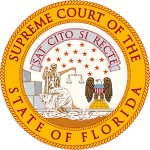 The full opinion from the Supreme Court of Florida can be found HERE. If you have any questions about access to the Supreme Court of Florida records, the Florida State Courts, or about any of our other products and services, contact us at customerservice@courttrax.com or give us a call: 866-643-7084 (Option 2).